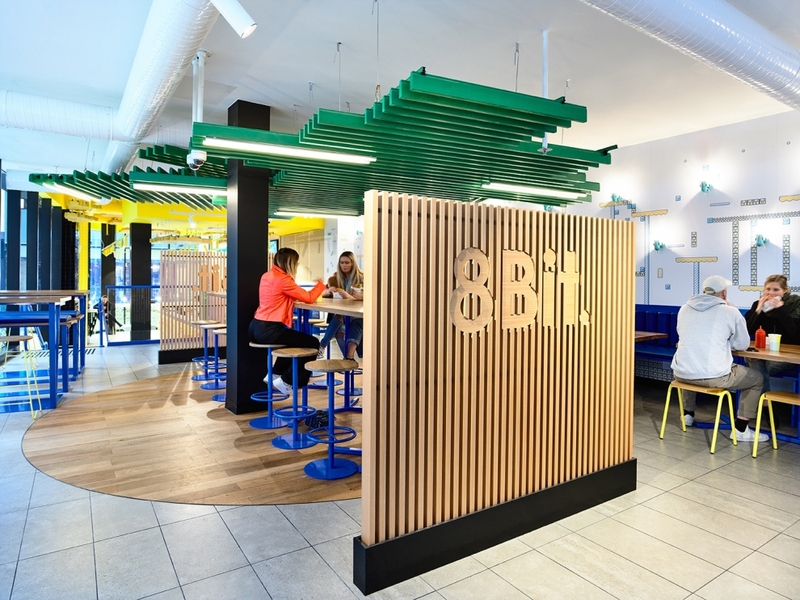 8bit 360, located on Little Collins Street, is the third and largest outlet of the Melbourne-based burger brand. 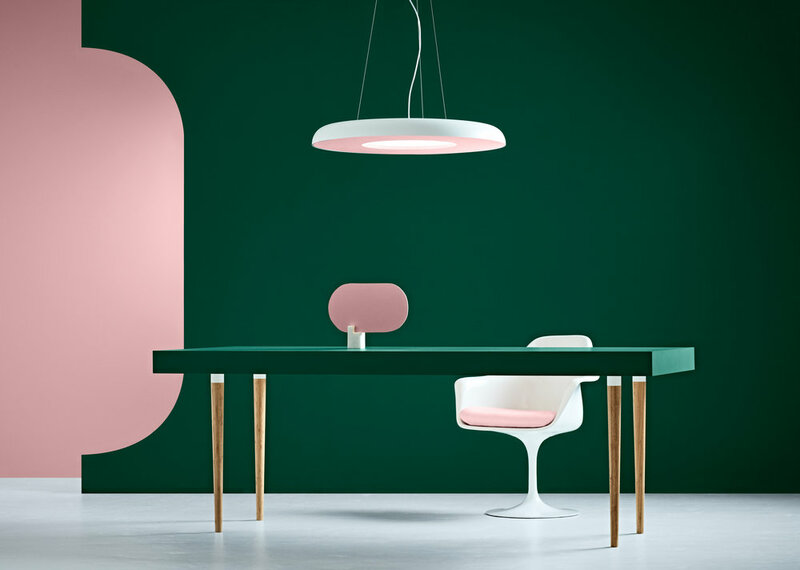 Inspired by American diners, old-school video games and the local fish ‘n’ shop, 8bit 360 is a contemporary throwback to the colourful 1980s, and our Wink Table Lamp and HD3 Wall Lights are adding to the nostalgic fun. The first 8bit started as an ode to the fish ‘n’ chip shop with arcade machines in the corner. The classic games still remain but the outlets have become streamlined and slicker with time. For 8bit 360, Architects EAT created a playful and interactive space with bold primary colours, pixelated patterns and Nintendo-inspired wall graphics. Architects EAT created pockets of intrigue and surprise as they played with colour and materiality. Tiles, like pixels, cover countertops; stools and booths are in blue powder-coated steel; and green and yellow acrylic tubes hover over high tables. 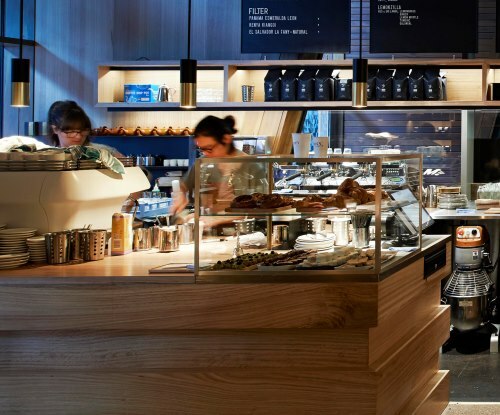 Timber elements keep the space warm and inviting, and include the timber-batten world map suspended from the bright yellow ceiling; timber panels surrounding the menu; and a timber batten screen with the logo carved it. Studio IO designed the original branding and established the red, yellow, dark blue and aqua colour palette, which the studio describes as “a nostalgic, quirky and instantly recognisable homage to good old-fashioned gaming.” Indeed, it’s nostalgia for the late-20s, early-30s demographic that form the target market. Our Wink Table Lamp and HD3 Wall Lamps in marine were the perfect choice for the colour palette, and complement the simple, pared-back forms throughout the space. Wink table lamps are perched on the counter around the windows. 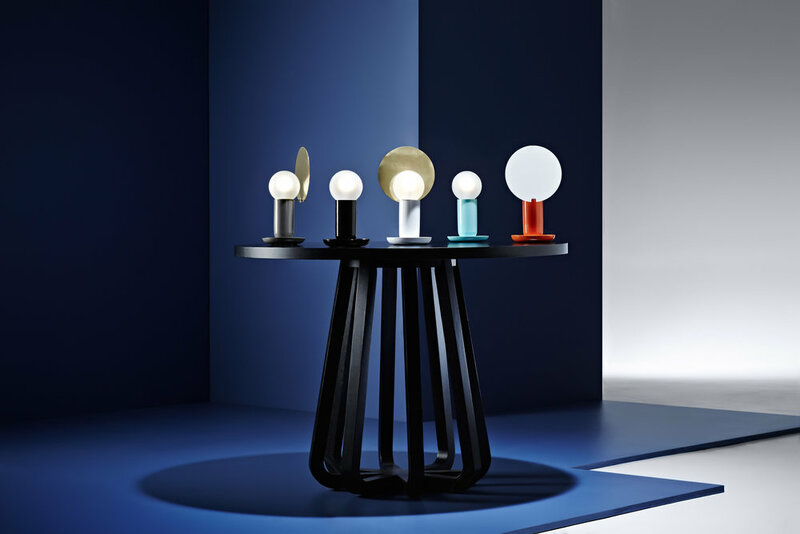 Inspired by candle lamps of yesteryear, they have a spherical bulb, dish base and optional metallic reflector for more control of the glowing LED lamp. HD3 has a similar form with a wall attachment. Fixed at alternating heights, the uplights cast patterns of light and shadow across the wall, adding another dimension to the gaming-inspired graphics. Each light has a 6W LED spherical frost lamps, a good choice for hospitality due to their long life, low energy use and high-quality light output. Introducing Teamwork - Acoustic lighting for workplaces. Our latest lighting collection has been developed to provide a solution for 2 common workplace needs - high quality energy efficient lighting and improved acoustics. 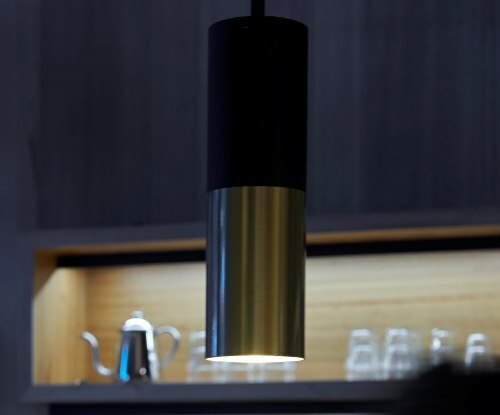 The Teamwork pendant has been designed to possesses special acoustic qualities to help it to absorb sound in the workplace making it the perfect pendant for meeting spaces and open plan offices. The effect of this sound absorbing feature is that the lighting contributes to enhancing both concentration and collaboration in the workplace by reducing ambient noise. 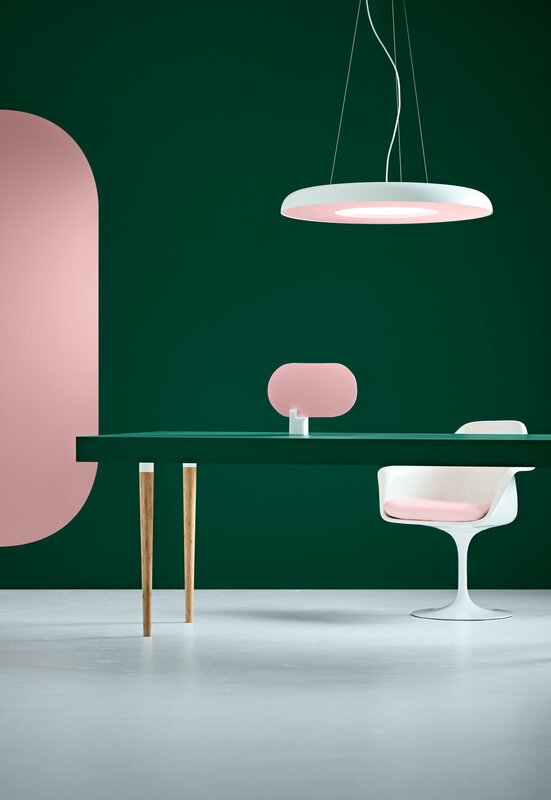 The Teamwork pendant shell is expertly crafted from spun aluminium and has a decorative fabric panel that discretely conceals an internal sound absorbing material. The outer shell is finished in matt anthracite or white. The fabric insert panel is available in a choice of 22 contemporary colours, with custom fabrics available on request. At the heart of Teamwork is an environmentally efficient LED lamp source with a special thin diffuser to ensure light is fully dispersed. This makes it an ideal light source for long meeting tables that require an even distribution of light to enhance workplace collaboration. Teamwork is also flexible enough to suit individual needs. It can direct light in a downward direction only but is also available with the option of up and down lighting, with both options compatible with a choice of popular dimming protocols. We seek to create endearing and enduring products designed to bring a space to life, which has been integrated in our latest Grapho Bubble design that appears to have a wonderful life of its own. 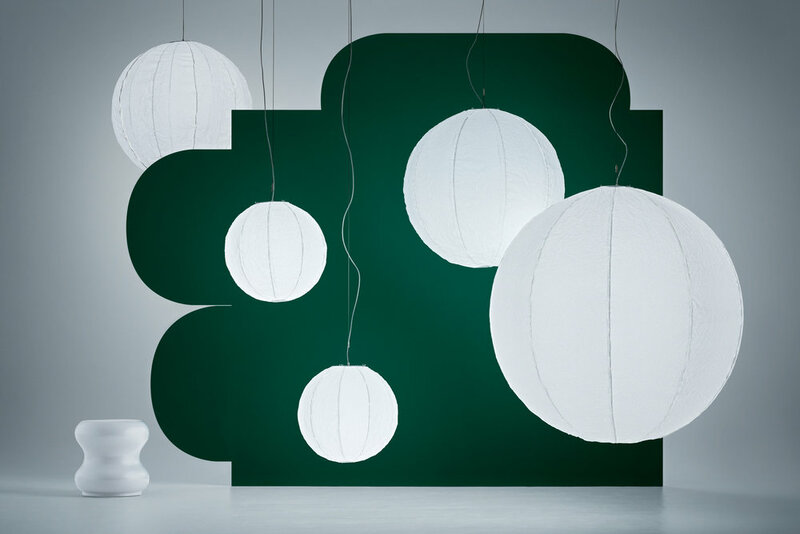 Imbued with personality and character, our Grapho Bubble is skilfully handcrafted in our Mentone factory from beautiful Japanese rice paper, which provides the light with an interactive quality, making it an irreverent take on a classic paper ball light. First launched at Melbourne’s DEN Fair 2017, the Grapho Bubble takes its name from the word meaning ‘to write’ or ‘to sketch’ as custom graphic designs can be added to the pendants during productions. When illuminated, our Grapho Bubble comes to life in more ways than one. A small fan inside the Grapho Bubble pendant is connected to the sustainable LED light source and inflates the rice paper when switched on. The LED can also be dimmable (upon request) for a variety of ambient settings. The Grapho Bubble inflates in as little as 20 seconds from being switched on and when switched off, the fan stops turning the light and it gently deflates. The Grapho Bubble is available in a diameter of 600mm and 1500mm. We invite you to preview the Grapho Bubble’s interactive feature in the video below. 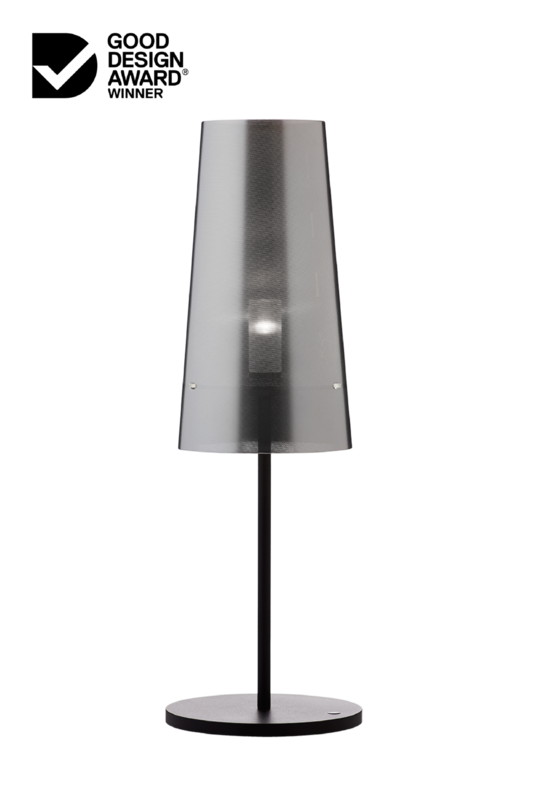 We are constantly updating the ISM Objects collection to keep pace with the latest technological developments in lighting, and the POP is a great example of this. 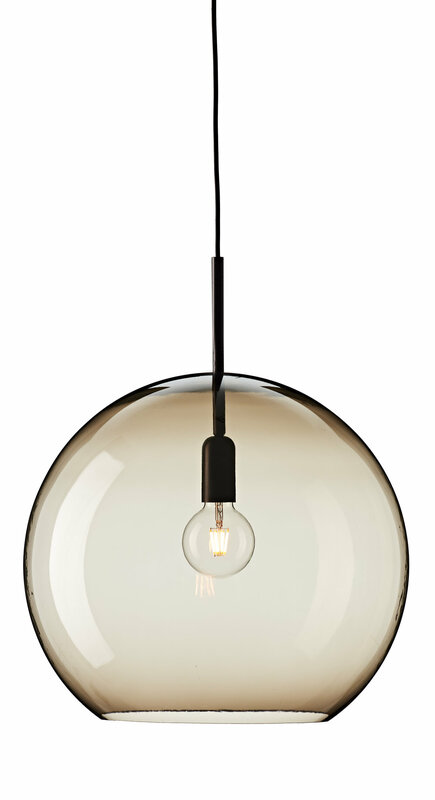 The revised POP pendant will add just the right amount of luxe to interior environments. Beautifully crafted from moulded polymer with a polished finish, their classic spherical shape makes them an enduring addition to any commercial or residential space plus our latest versions are LED compatible. Even the finest interior designs can fall flat without the right lighting. That’s why the our Pop Pendants are the perfect addition. They enhance the atmosphere of any interior space and bring a pop of personality that is truly unique. 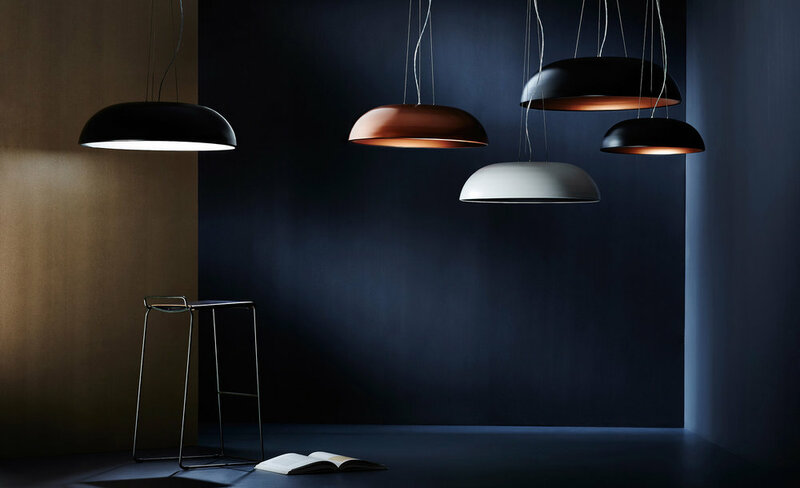 The Pop Pendants are available in two sizes and their suspension comes in a smart black fabric cable with black metal components, which is adjustable on installation. 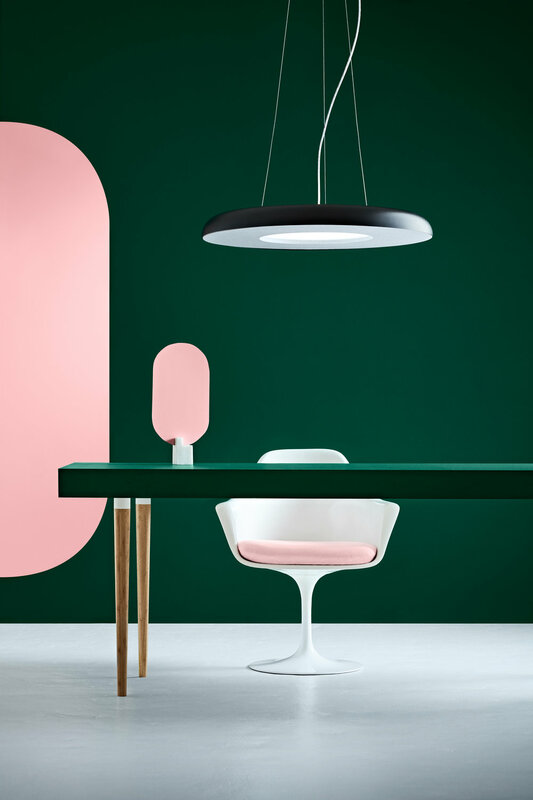 The pared-back palette (including Opal, Clear, and Smoke) along with the classic form of the Pop Pendants makes them the perfect complement to a wide range of interior design schemes and like all ISM Objects’ designs, they’ll never goes out of style. There are always dominant trends in interiors. Black and gold is firmly cemented in the spotlight as a versatile combination that suits a range of interior styles and with a beautiful selection of designs from us it’s clear we think it has a bright future. The combination of black and gold makes an elegant statement within interior environments. 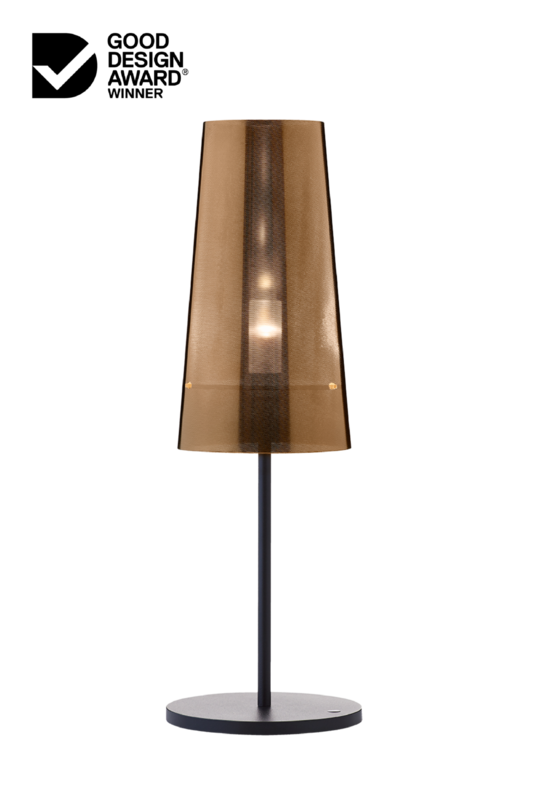 Designers need not be limited in their ways of introducing this trend to the finest spaces, a lighting statement perfectly captures the sleek, striking blend of black and golden brass. We think these perfectly capture the classic interior trend for black and gold. They feature classic forms and unique detailing that will never date.